Seismologists believe there's an increased likelihood of a hazardous event at Mount St. Helens due to a strengthening series of earthquakes at the volcano. Initially, hundreds of tiny earthquakes that began Thursday morning had slowly declined through Saturday. By Sunday, however, there had been more than 10 temblors of magnitude 2.0 to 2.8, the most in a 24-hour period since the last dome-building eruption in October 1986, Scott said. 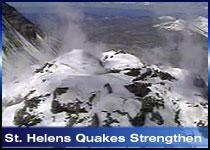 Mount St. Helens is about 55 miles northeast of Portland, Ore. The cause and outcome of the swarm were uncertain Sunday evening. Seismic activity at Mount St. Helens has changed significantly during the past 24 hours and the changes make us believe that there is an increased likelihood of a hazardous event, which warrants release of this Notice of Volcanic Unrest. The cause and outcome of the earthquake swarm are uncertain at this time.